Cotyledon orbiculata flat leaf (Crassulaceae). 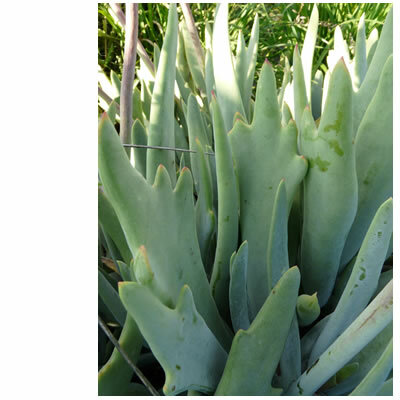 This hardy, drought resistant, evergreen, succulent groundcover has flat leaves. The umbels of apricot to reddish colored flowers grow on long stalks and are borne in mid-summer. Plant in sun or semi-shade. 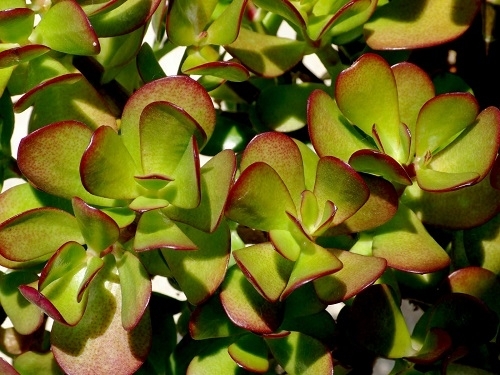 Crassula ovata (Crassulaceae) A large well-branched, compact, rounded, evergreen shrub 1 - 3 m tall with glossy, dark grey-green, oval, succulent leaves and rounded heads of pink flowers in winter-spring. 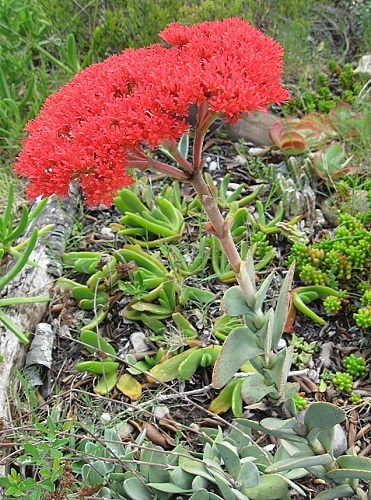 Crassula perfoliata var. 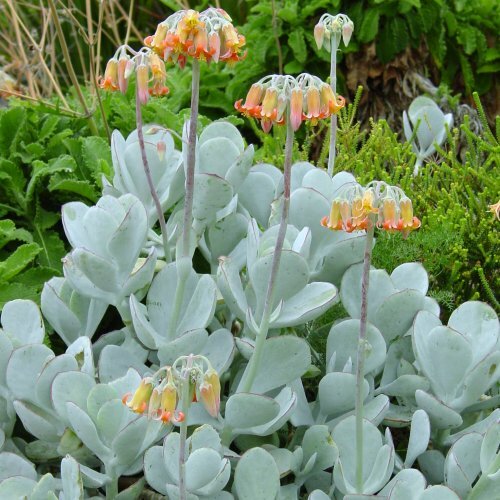 major (Crassulaceae) It is an attractive summer-flowering succulent with greyish-green sickle-shaped leaves and red flowers. Crocosmia aurea (Iridaceae). 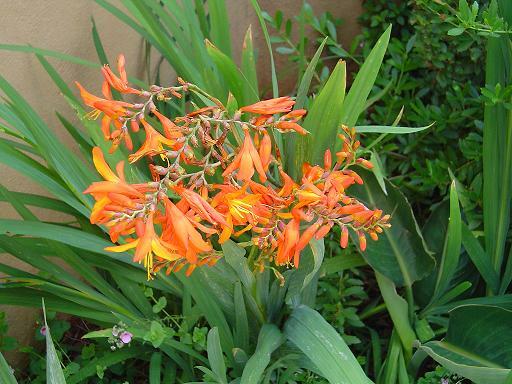 Decidous bulb that grows up to 1m with bright yellow to orange star shaped flowers that appear in late summer. 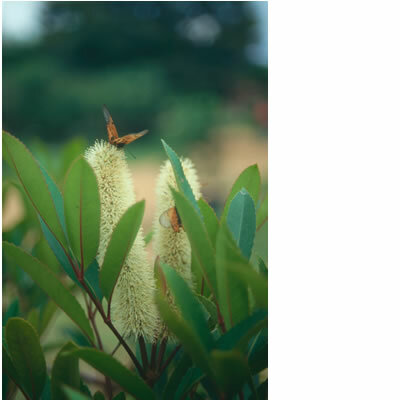 Grows well in semi shade, rich soil. In milder areas they tend to stay evergreen. Cucumis myriocarpus (Cucurbitaceae) Cucumis myriocarpus is an annual, climbing plant with stems up to 2 metres long. The stems scramble over the ground or climb into the surrounding vegetation where they support themselves by means of tendrils. Cyathea australis (Cyatheaceae). 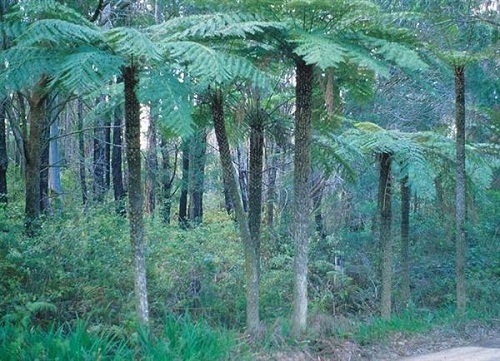 From the forests of Southeast Australia comes this medium to large sized tree fern. It is an attractive, reasonably fast-growing treefern with a stocky, black trunk. Sowing : Sow seeds in summer in a damp condition.